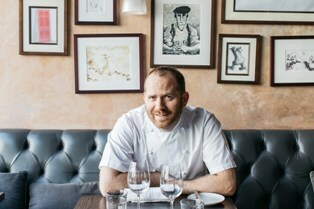 Bryn Williams Payne & Gunter chef partnership Bryn Williams made his mark back in 2006 by winning a course on the Great British menu for the Queen’s 80th birthday banquet. Since then he’s gone from strength to strength but has kept the royal connection going, having recently partnered with Payne & Gunter at the Royal Windsor Horse Show for the Queen’s 90th birthday celebrations. Bryn has recently opened a new restaurant at Somerset House, where the menu has a strong focus on sustainability, seasonality and provenance. As Bryn puts it ‘I’m a firm believer that a piece of fruit or veg should be treated with the same amount of care and respect as a cut of meat or fillet of fish – if not more’. In October the East Wing Galleries at Somerset House were showcased at an event hosted by Payne & Gunter in collaboration with Bryn. 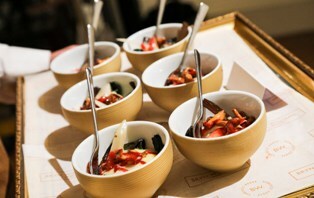 150 exclusive clients were entertained at one of London’s most iconic cultural landmarks for the prestigious showcase. During the evening, guests enjoyed an exclusive menu which featured delicious dishes including; compressed watermelon, Dorset crab and avocado, rainbow chard, and Pink Lady posset. We’ve partnered with Dipna Anand, author of Beyond Brilliant, to make menus with plenty of variety and spice. Raised in London with a family of chefs, Dipna’s a natural partner for us to create exciting and delicious menu options that celebrate the Indian flavours craved by many guests at our events. Dipna says: “The secret of my success is dedication, passion and determination – as well as a continuing love affair with Indian cooking. 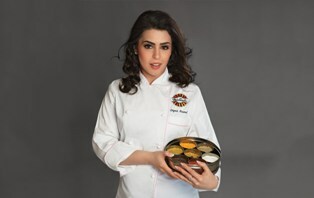 Through this exciting collaboration with Payne & Gunter, I can bring the fantastic dishes I grew up with to a wider audience.” Menus feature Indian inspirations such as a street-food style alu papri chaat and mains such as mutton biryani. The classic dishes are presented in a contemporary and colourful way that make these truly irresistible and tempt guests’ palette upon sight (and smell!). We have been truly inspired by Lisa’s story, relationship and food ethos, ‘to eat what nourishes your body, do what nourishes your soul, and think what nourishes your mind’. We particularly love to serve nourishing food that appeals to a range of preferences and requirements such as gluten-free, dairy-free and reduced refined sugar recipes. 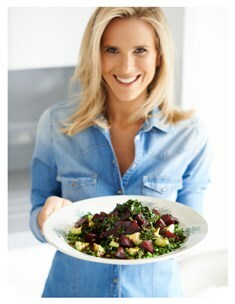 Offering healthy alternatives to traditional dishes and encouraging people to eat mindfully. Here at Payne & Gunter we believe there is no need to compromise when it comes to taste and nutrition so partnering with Lisa makes great sense as we clearly share values and passions. As Lisa says; ‘For me, food is a ritual and I relish the entire process, from the exhilaration of creating new wholesome recipes, to the joy in sharing them through my work, and with my family and friends’. We are really looking forward to collaborating with Lisa in a truly balanced partnership to entertain and nourish guests together.